Collins: senior understudy, but number one for Cork's U21s. GOALKEEPING RUNS DEEP in the Collins family in Ballinhassig, County Cork. This evening, Cork take on Limerick in the Bord Gáis Energy Munster U21HC final in the Gaelic Grounds (7.30pm), with their goalkeeper Patrick Collins playing his fifth straight campaign at the grade. With his father Pat having been a goalkeeper and older brother Matthew featuring for Cork, it seemed inevitable that Patrick would continue the pattern. “We’ve a strong household of keepers,” he says. “My father played for Ballinhassig, then my older brother Matthew played minor, U21 and intermediate for Cork, and Ger is the current minor goalkeeper. “My other brother Michael lost out a small bit, he only played in goal once or twice, he didn’t like it at all! “I used to always play outfield, then I started playing in goal for the age-group ahead of me as they were stuck for a keeper, my father was a selector with them. Collins is a busy man. As well as being Cork’s U21 netminder, he was in goal as the Rebels lost to Kilkenny in Sunday’s All-Ireland intermediate final and backs up Anthony Nash at senior level. 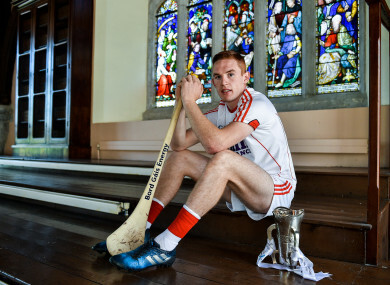 Throw in Ballinhassig in the Cork premier intermediate championship and Cork IT at senior level, and there’s no shortage of exposure, but that’s how he wants it. “It’s the game-time that you want, especially as a keeper,” he says. I try to get involved with every team that I can, the more games, the more experience and the more you learn. “At the start of the year, I sat down and thought about where I wanted to play for Ballinhassig. Time is on his side at senior level, with the consistency of Anthony Nash meaning that his outings have restricted to the Munster and national hurling leagues thus far. Being a sub goalkeeper can mean a lot of time kicking his heels, but Collins is satisfied that he has been doing his bit for the team. “In fairness to Anthony, he has been excellent all summer,” he says. Definitely, I try to challenge him and improve him as much as I can, try and push him. He has been playing so well, hopefully that’s reflecting the hard work that he’s putting in in training. Collins knows that he and his team-mates will have to be at the top of their game tonight, too. Having scraped past Waterford in the semi-final with a late Declan Dalton penalty, they can’t rely on luck. “The Waterford game was a great victory,” he says. “Things looked as if they were slipping away towards the end, but luckily we got a penalty and in fairness to Deccie he struck it well. “We came away lucky in a way, and we know about the size of the challenge facing us on Wednesday, we’re not going to deny that. Limerick have been very impressive in their first two games. – Patrick Collins was speaking ahead of the Bord Gáis Energy GAA Hurling U21 Munster Final. Fans unable to attend the game can catch all the action live on TG4 or follow #HurlingToTheCore online. Email “'The more games, the more you learn': Cork keeper Collins is one of the busiest youngsters in hurling”. Feedback on “'The more games, the more you learn': Cork keeper Collins is one of the busiest youngsters in hurling”.